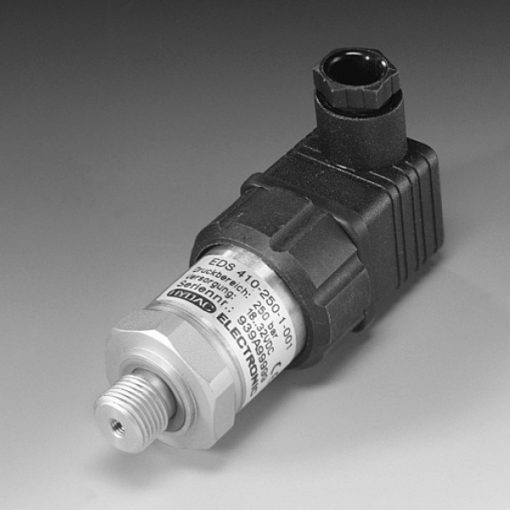 The electronic pressure switch EDS 410 serves for use in volume production machines. It is based on the EDS 4000 pressure switch series. What’s more, one or two transistor switching outputs (PNP) are available on the EDS 410. N/C or N/O can define these transistor switching outputs. Furthermore, the switching and reset points of the EDS 410 are factory-set according to customer specification (not field adjustable). As with the EDS 4000 standard model, the EDS 410 has a ceramic measurement cell with thick-film strain gauge for measuring relative pressure in the low-pressure range. It also has a stainless steel measurement cell with thin-film strain gauge for measuring in the high-pressure range. Various pressure ranges between 0 .. 1 bar and 0 .. 600 bar as well as different electrical and mechanical connection types are available.